Prawns / Chemmeen Biryani | Simple and Delicious ! I hope you all might have known that kerals.com and tastyland blogspot.com have copied many of blogger's food photoes including salkkaaram's. I too had requested them to remove those pictures but didn't get a response yet. Please do notify us bloggers when you see any of our recipes or pictures in other websites.That would be very helpful. Heat enough ghee or oil in a frying pan and fry the marinated prawns in that.Remove it from the pan when it is done and keep aside. Heat a heavy bottomed vessel and pour ghee or oil. Add the oil or ghee remained after frying prawns too.Saute chopped onions in that. When it is reached transparency, add garlic-ginger paste, chilli paste and saute again for few seconds. Add chopped tomatoes, all the powders, salt, and cook for few minutes by stirring occasionally. Again add chopped coriander and mint leaves, saute them too. Add curd and mix well.Then add coconutmilk and when it begins to boil, put the fried prawns in to that and boil for few minutes. Let the masala turn thick.Check salt.Remove from fire. Boil water.Put 2 cardamoms, 2 cloves, 2 pieces of cinnamon sticks of 1" length and salt in to it. If you like yellow color biriyani add little turmeric powder also.Cook rice in this and drain water when it is about done. (you can make ghee rice instead of this). Heat a heavy bottomed or nonstick vessel again, pour little ghee. Remove it from fire. Put about 2 plates of rice. Spread little lemon juice and ghee over it. If you like, use little saffron mixed with milk too. Then spread some prawns masala over it evenly. Again put rice over it and repeat the process until the rice and masala are over. Cover the vessel tightly with the lid, (cover with aluminium foil before you place lid) keep on a low flame for about 10 minutes and remove. (You can see steam comes on top if you open lid a little) Mix well after half hour and keep it like that for a while before you serve.You can add fried onions, ghee roasted cashews , raisins, coriander leaves and mint leaves in between layers. Have this biryani with pudina chammanthi , curd and pickle. Chemmeen Biriyani super aayitundu:) I prepared fish biriyani recently. Next time when we buy chemmeen.. sure im going to make this... in my wrods.. it looks yum!!! Looks delicious! Love the color of your rice. Thank you so much for the prawns biryani recipe. I also tried ulli vada , chicken varthuarichu,hummus, chicken fry. O my god lovely !! I must say i am big fan of yours now !!! Once more Thanks Seena, earlier i was diehard in search for prawns biriyani and now it come to and end. Even any doubt in cooking solution is your Website !! Watered in mouth.....I like it very much. I ate chicken biryani mutton biryani but Prawn Biryani i have never taste yet.So I'll make it soon. ur chemmeen biriyani looks yummy. Im gonna prepare them today.Im a regular visitor of ur blog looking for malabar dishes.Sounds like u r from thalassery/kannur region. All the food that u post are made at our home tooo. U gota wonderful blog here with variety of good foods.thanks. made ur chemmeen biriyani today and it was wonderful. But i did a mistake of adding more green chillies thinking that 4 is too less and it became a bit too hot for me.Else it was very very nice. I will cook some more rice andadd to it. I will try ur fish biriyani next. thanks alot for the recipe. Thanks for the fb and happy to know u loved it! Yeah, I wouldn't add much chilly to dishes normally. For this 4 green chillies are enough, u can add more depending on it's spicyness. i tried ur prawns biriyani recipe..and the result was wonderful...thanks..
hearty congrats to u seena! i'm femina from guruvayoor..now in qatar.i tried chemmeen biriyani for lunch today and it was a hit.i prepared in the pressure cooker though. thanx for all the recipes. i had also tried egg biriyani and machbooz, which were also delicious. once again,thanx. 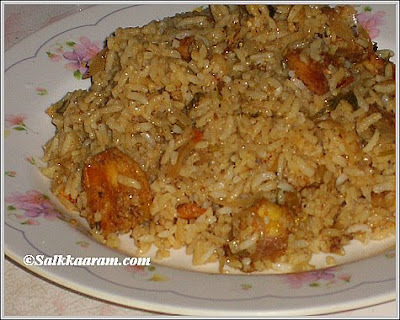 I prepared Fish (Salmon) Biriyani by following the above recipie..It was simply superb!!! My husband liked that a lot..Thank you soooo much for the recipie..
Hi Seena, yesterday prepared parwns biryani. Well,can say it tasted good, it had good flavour but I need to improve a lot... rice became a bit mushy and the quantity of prawns was a less I guess... I have a doubt, how much do I need to fry the prawns? Tried out this recipe after googling for it. came out tasty. Thank you! i am a guy who tried your recipe just now and got a delicious output. This was my first time in kitchen and it was a success. thanks a lot. Sorry Nimi, I think I forgot to answer your query.. :) Just fry the prawns until it is half cooked and slightly brown out side.. Tried this today.. awesome...am in love with it.Read a query above regarding which rice is this - usually biriyani specialists use a variety of basmati rice called Wayanadan Kaima or jeerakasala rice. We get it in almost all supermarkets. I guess thats how they prepare the authentic biriyani in restaurants n all. I use kaima rice only and it tastes superb!Try out.